New captain Kirsty McGuinness believes Linfield Ladies' winning mentality can take them to four Women's Premiership titles in a row. The Blues have won the last three league titles and made it a double last year by lifting the League Cup. They also reached the Challenge Cup and County Antrim Cup finals, but McGuinness was not happy with their campaign. "We won two out of four trophies but were disappointed," she explained. "We're a big group of winners, we aren't 12 any more - we don't play for fun, we play to win. "It doesn't matter whether we've won the league three, four or five times in a row, no matter what it is we will still go into every game wanting to win." 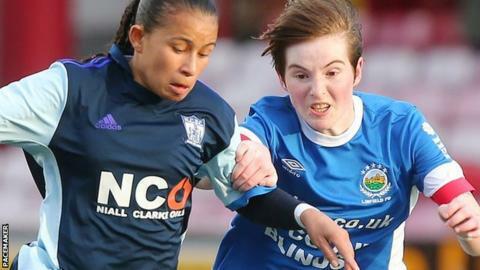 The women's football season in Northern Ireland began on Monday with the first round of the County Antrim Cup, in which Phil Lewis's Linfield lost 1-0 to Cliftonville. The league campaign kicks of on Wednesday night, with the Blues beginning the defence of their crown at home to Sion Swifts Ladies. McGuinness, who has taken on the captain's armband after the retirement of the experienced Sarah Venney, believes the players' togetherness and the club's strong youth academy have been crucial to their recent success. "We are such a close squad, we do so much together on and off the pitch," she continued. "We have got the balance of youth and experience right in recent years. The youth set-up is unbelievable and the players coming through are really pushing on. "The youth academy is vital to our ongoing success as we need players coming through and competing for places in the squad. I'm only 24 and I think I'm considered one of our older players." While McGuinness and her Linfield teammates have plenty of experience of the Women's Premiership, newly-promoted Comber Rec are looking forward to their first season in the top flight. The club was only formed seven years ago and, as they prepare for a trip to Glentoran Women in their opening match, midfielder Laura Clarke said survival will be their main target. "We are not going to get carried away with ourselves and will see how we sit after we've played everyone once, but at the minute our main focus is to stay in the League," said Clarke. "It's a baptism of fire with Glentoran away in the first match and then Cliftonville at Solitude, but this is where we want to be and we are going to enjoy the experience. "It means so much for the club to be in the Premiership. We've done it in super quick time and are well ahead of schedule, but we have prepared for this season the way we always have done." Last season's league runners-up Glentoran Women have appointed former Irish League men's striker Diarmuid O'Carroll, who won the league with Cliftonville and Crusaders, as manager during the close season. The east Belfast club have recently re-signed Northern Ireland goalkeeper Emma Higgins, who has previously had spells with Leeds United and Doncaster Rovers Belles as well as playing in Iceland. The Glens finished 12 points behind the Blues in last season's title race, but Higgins is confident she and her new teammates can close that gap this campaign. "Glentoran has always been in my heart, I grew up playing for them and am delighted to be back," she said. "Diarmuid has fantastic experience in the men's game and enjoyed a lot of success. His passion and desire to succeed will hugely benefit the squad, especially the younger girls. "I am confident that I can help us concede fewer goals this season and close the gap on Linfield. We know Comber Rec are going to come at us in the opening match and we need to be ready for that." Crusaders Strikers have won the Women's Premiership six times, but have not lifted the title since 2012 and finished fourth in the table last year. The north Belfast outfit have appointed Spike Hill as manager during the close season and begin their league campaign at home to Derry City. The north-west club, who have dropped the term 'Ladies' from their name, will be hoping to maintain their top-flight status after promotion in 2015 was followed by relegation the following season and another promotion in 2017. Last season's third-placed Cliftonville Ladies are not in action on Wednesday and begin their league campaign at home to Comber Rec on 24 April.